Sydhavnen is the southern harbour district of Copenhagen, located south of the historic city. 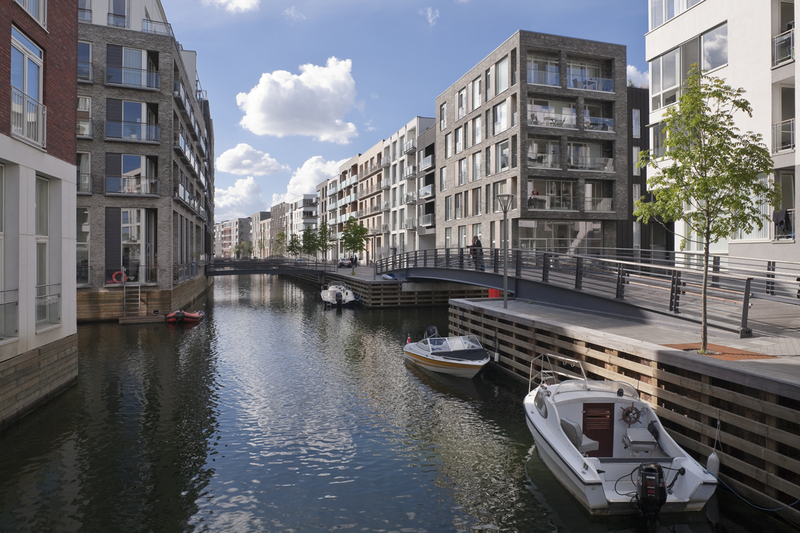 With Java Island in Amsterdam as an example, Sjoerd Soeters was asked by the Municipality of Copenhagen to make a plan for the transformation of Sydhavnen into a residential area. This plan consists entirely of city blocks, situated so as to be oriented toward the water on all sides. In order to achieve this, kilometres of canal were added to the area. The size of the blocks in Sydhavnen are based on the dimensions of the large city blocks in the centre of Copenhagen. The twists and curves of the canals create constantly changing spatial effects and sight lines. Sluseholmen is the first application of the Sydhavnen plan. The island is characterised by a panoramic view of the surrounding water and a more intimate inner side. The inner area is formed by a curved main canal and several short lateral canals. Each city block is a single structure that contains a variety of dwelling types. The facades, however, were worked out by different Danish architects, supearvised by Sjoerd Soeters. Architectural guidelines were set for materials, colours, spatial effects and building height, to ensure that each city block remained coherent and fitted in with the greater ensemble. This is a truly amazing undertaking! The fact that agreement could be reached whereby the block architecture was separated from the facades is truly amazing and important to understand more. For example, how exactly was the boundary indicated between these two interventions? There must have been some sort of drawings made at the beginning, indicating the “depth dimension” of each facade (to be undertaken by a given architectural office) and also showing the width of each facade, etc. I’m assuming that the design drawings of the “block” and the multiple facades were finally assembled into one set of contract / construction documents, right? Who did that work? The description given in the website gives the overall understanding, yet certain key issues of coordination and distribution of responsibility remain unclear. Thank you!